Arabella is a gorgeous rich fuchsia/magenta hybrid with silver sparkle. Applied perfectly in one coat. This one is very unique -- I definitely don't have a color like this in my collection. Carter is a bold regal purple with silver sparkle. I'm LOVING this color. It reminds me a lot of Zoya Roxy, just with the matte PixieDust finish. Seen here with one coat. Chita is a rich dark green with silver sparkle. It reminds me of the dense forests in Vermont! I love a good green nail polish and this definitely hits the nail on the head. Seen here with one coat. Dhara is described by Zoya as a dazzling copper, but I see it more as a fiery orange with gold sparkle. It's pretty, but the one I like least in the collection -- mainly because I just don't like how it looks with my skin tone. Definitely a great summer pedicure color though! Seen here with two coats. Sunshine is a deep blue with silver shimmer. This is my favorite of the collection -- it applies perfectly with one coat and it's reminiscent of the night sky. Gorgeous. Tomoko is a dense silver glitter. This one reminds me a lot of Essie Beyond Cozy, though more matte. It was pretty with one coat but unbelievably rich with two! And here's the best part. 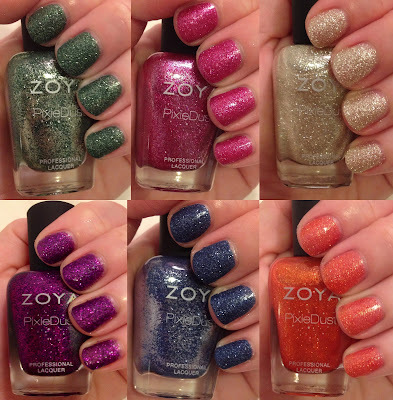 One winner will receive the entire Zoya Fall 2013 PixieDust Collection today! This giveaway has a retail value of $54. To enter, use the Rafflecopter widget below. Good luck! This giveaway ends on Tuesday, August 6 at midnight. One winner will be chosen AT RANDOM on Wednesday, August 7. Multiple entries will be disqualified. Giveaway is open to US residents only. sunshine or Carter, both so pretty! I love the color Sunshine! It's gorgeous, and perfect for fall! I'm in love with Carter. Must have! I adore Tomoko and Carter! I like Carter the most - it really IS bold! OMG!!! Love Sunshine and Tomoko!! I'm anxious to try the orange...seems like it could be an awesome update to my typical summer coral. But he baby and the gold/silver will be my staples for sure. Love this giveaway! I love the Dhara color. I like the Arabella color! So pretty! I've gotta choose Tomoko, because it really looks like pixie dust! I've been drooling over Sunshine since I saw the first swatch. Hard to choose 1 but I love Chita AND Sunshine!! I love the Arabella color! My favorite color is Tomoko. I think Dhara is my favorite, lovely color. L O V I N G Chita and Carter! Tomoko is my fav. It looks to me like a perfect winter color. I love golds and creams and such in the winter. Kinda backwards I know haha. I just love the Carter! It's a tie between Chita and Sunshine. Love them both! I usually gravitate towards greens, but Tomoko is calling my name! Right now, Sunshine. Every time I look at swatches, I change my mind about my favourite! Tie between Arabella and Carter! It's so hard to choose but I think Carter is my favorite! Sunshine is perfect for fall. I love it! My favorites are Sunshine and Tomoko. Thanks so much! I like the blure color. Carter!!! I love this rich purple polish! Chita & Sunshine = Happiness!!! Sunshine is very pretty but they are all awesome! I like Tomoko and Sunshine a lot! They're awesome! I like the Dhara color. I'm a sucker for purple so carter is definitely my fav! Carter or Sunshine! Both are gorgeous. I love Tomoko! Great winter wedding color! Tomoko and Sunshine are gorgeous. Carter is my fav. I neeeed it. Carter and Dhara are both gorgeous. I love all of these. It is so hard to choose! I love Carter, but I think Arabella is my favorite. I think Tomoko is my favorite, but Carter and Arabella are so pretty too!! Arabella & Dhara! But all are super cute! Im attracted to Tomoko more than any of the others, but they are all seriously gorgeous! Im in love :) Thanks for doing this giveaway girl! I like the Dhara the best. Hunter was my favorite. It really shocked me with how beautiful it was. OOPS, HAHA I mean Chita. IDK WHERE in the world I got Hunter from. Tomoko and Dhara are my favorites. Hands down Carter is definitely my favorite! Carter is my favorite, it's just perfect.